Those who know me will testify that I have an all-encompassing love for cleansing… but not just any old cleansing, nope… no cotton pads go near my face because I hot cloth cleanse (also referred to as HCC). I was introduced to this wondrous beautifying technique a few years ago whilst reading my favourite weekly beauty column in the Guardian, by beauty writer Sali Hughes (she now has her own website, and it’s amazing Sali Hughes Beauty. I warn you, if you visit the site, hours of your day will disappear. DO IT!). I haven’t missed a day. I cleanse twice daily, morning and as soon as I get home from work. I know this might make me sound like a super-loser, but I really look forward to it. I know it’s hard to add an extra thing into your morning grooming routine, especially if like me, getting ready for work is like being caught up in a fierce whirlwind… but this addition is worth it and it doesn’t take long at all. 2 minutes max! Who hasn’t got 2 minutes to spare?! The process couldn’t be simpler. All you need is a cream cleanser/cleansing balm and a small face towel. I followed Sali’s advice and bought 8, one for each day, and a spare. 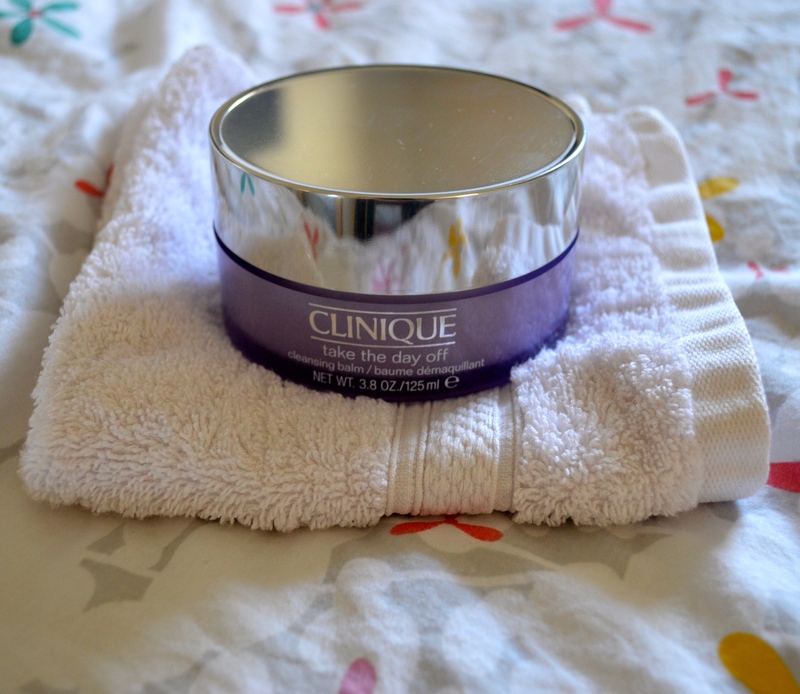 I’m currently using Clinique Take The Day Off Cleansing Balm, I’ve been using it for a few months now and it’s great for removing makeup in one fell swoop. All you need to do is take a small amount of the cleansing balm, (which has a similar consistency to solidified coconut oil), rub it between your hands – you’ll notice it almost immediately breaks down into an oil – and apply to your face, massaging it in. It breaks down all make-up, even the blackest of black mascara, liquid eyeliner, eyeshadow – you get the point – with ease. Once your face is a beautiful smudged make-up mess, drench your face towel under the hot water – let’s say hand-hot, we don’t want scalded faces. Wring out so it’s not dripping wet, and start removing the cleansing balm. This is my favourite part. I know it’s the middle of the afternoon but writing about it makes me want to HCC right now. I digress. Where was I? Okay, I stick the face towel under the hot water and repeat the removal process at least once. It’s quick, easy and best of all, leaves your skin completely clean, soft, with no visible trace of make-up! The process is exactly the same if you use a different kind of cleanser. I like to use a creamy cleanser in the morning and then the cleansing balm in the evening, but I’ve run out of my cream cleanser – definitely a good excuse to go shopping! Are you a HCC virgin or a dedicated cleanser like me? If you haven’t tried it, you might like it!